(Nanowerk News) Researchers at Columbia University's Nanoscience Center are on the verge of solving one of the most vexing barriers facing advances in molecular electronics: incorporating individual molecules into functional nanoscale devices and exploiting their electrical and chemical properties. Scientists have long been intrigued by carbon nanotubes, tiny straws of pure carbon measuring less than a hair's width across. Successfully linking them in stable arrangements would allow for an impressive increase in both the speed and power of a variety of electronics. This new research at Columbia sets the stage for advances in real-time diagnosis and disease treatment, surgical robotics, and information storage and retrieval, potentially rendering room-sized supercomputers obsolete. 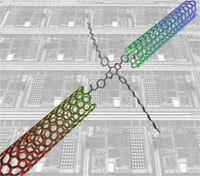 Previously, researchers working in this area of nanotechnology have made transistors out of carbon nanotubes with switches connecting molecules to metal wire leads. This Columbia research illustrates a more elegant way of making molecular transistors, since the nanotube leads are already the same size as the molecules, and they are made of carbon, making it easier to connect them chemically. In the Jan. 20, 2006, issue of Science, Columbia scientists explain how they have developed a unique way to connect the ends of carbon nanotubes by forming robust molecular bridges between them. The Columbia team was able to combine the best qualities of carbon nanotubes and organic molecules in a single electronic switch, the journal reported. This new method of wiring molecules into the gaps of single-walled carbon nanotubes employs oxidative cutting -- a lithographic technique that makes each cut-end of the nanotube more prone to molecular bonding. These new methods of constructing molecular bridges could one day revolutionize the size and scale of computer hardware by allowing engineers to design circuits at the nanoscale limits. The Columbia research, involving the ability to link nanotubes with an incredibly small diameter, brings scientists closer to creating miniature devices that also process information with molecules. "Molecular electronics has real-world relevance," says Colin Nuckolls, an associate professor of chemistry, and a co-author of the Science paper. "It opens the door to new types of ultrasmall switches and sensors. We are able to form a bridge, both literally and figuratively, by combining reaction chemistry with ultrafine lithography." The nanotubes themselves are long, thin cylinders of carbon unique for their size, shape and physical structure. They can be thought of as a sheet of graphite forming a hexagonal lattice of carbon, (see image) rolled into a tube, explains Columbia senior research scientist Shalom Wind, another co-author of the paper. They have been shown to possess remarkable mechanical and electronic properties, he added. Attaching molecular wires to single-walled nanotubes involves cutting a tube using nanolithography combined with a localized oxidation process that leaves a nanotube with two ends that are capped with carbon-based acid groups and separated by a molecule-sized gap. In that tiny space, a molecule can be chemically joined with each end to form a robust nanotube/molecule complex, which operates as a nanoscale transistor. The nature of this work is also expected to keep alive "Moore's Law," the prediction made in 1965 by Intel co-founder Gordon Moore who predicted the number of transistors per square inch on integrated circuits would double every year. Moore said the trend would continue for the foreseeable future; but without an order-of-magnitude shift in the scale of computer circuitry -- a promise represented in Columbia's latest work–that prediction could hit a wall in the next decade, experts say.